You can watch the 8 (eight) hours of the Volcom Bergfest bowl contest 2012, but the best parts start at 5:30 (5 hours and 30) minutes with the pro sesh, at 6:00 for the Bergfest Pro finals and at 6:30 for the Double!! Last week-end at Münster took place the Volcom Bergfest 2012. The total Prize Money was $6.000. 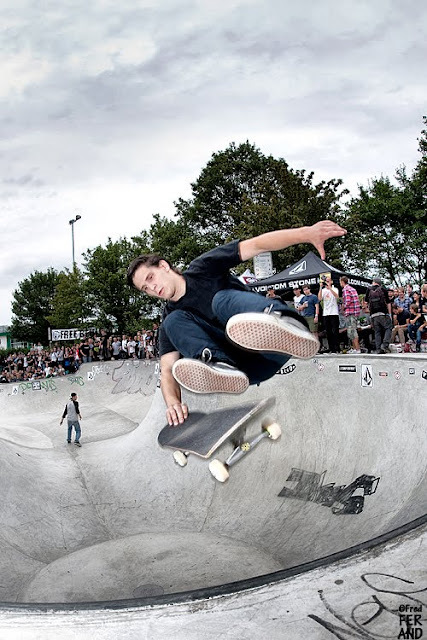 The Contest took place at the infamous Berg Fidel Skatepark in Münster, Germany. This park was well known for the legendary Bowl Sessions at the Münster Monster Masterships in the 90′s. There was the Am, Pro and Masters Divisions. Besides the main contest there also was be a Death Race, a Best Doubles Contest in the Bowl and Best Trick over the Berg Rail. To top it off they were really happy to be able to present you the legendary punk band ‘The Adolescents’ as this year’s music highlight. This year, a flurry of contestants flooded the Berg Fidel Bowl , including Ben Hatchel who just registered for the Bergfest and landed #1 in 2011. Thanks to Fred Ferand for the picture. Used with permission.